Making Leeds the Best City to Grow Old In is one of Leeds City Council’s seven breakthrough projects. These projects provide a focus on priorities in key areas of work. An event was held in March to bring partners together to discuss how we can all help make Leeds the best city to grow old in. This post is an update from that event. The event aimed to bring together a wide range of organisations across the public, private and third sector (listed at the end of this post) using the eight World Health Organisation (WHO) Age Friendly City domains (listed below) to identify what we should be working towards and how we will measure progress. 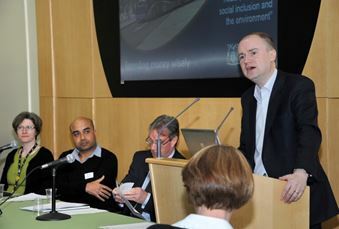 Speakers included Leeds City Council Chief Executive Tom Riordan and John Welham from Leeds Older People’s Forum. 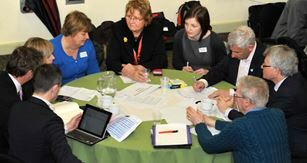 All tables were asked to consider the impact on inequalities in health and wellbeing, and a focus on the most vulnerable older people. The following is a summary of what was put forward from each of the eight discussions. We will use this information, and the issues which older people have already told us are a priority, to form a plan of action for Age Friendly Leeds. Older people have a say/voice within the city. Engaging people/reaching people who are seldom heard within the city ‘and the unknown’. Broaden up choices and possibilities, including employment, for older people – stop trying to pigeon hole. People are seen as individuals not just a group ‘older people’ with different needs and different skills to offer to the city are recognised. At least one high profile consultation event per year for the next 5 years with a 10% year on year increase of new participants. Increase in number of people accessing neighbourhood networks by 10% year on year. Responses to the addition of information about the 7 best initiatives on all council tax letters with information on how to find out more and tick box to send back if interested (or similar info that goes to all residents of Leeds). The number of older employees within Leeds within key sectors increased year on year by 5 years by 5% (sectors to be decided). An increase by 5% in high profile positive role models (over 55) within key areas in the city each year. Missing partners: Transport companies and public sector transport teams. Older people/private sector/business/disability experts/further education sector/NHS/CCGS/GPS/wider community (not just older people)/local and parish council/faith groups. Information needed: baseline data (e.g. Leeds Observatory). Presentation at neighbourhood networks and other key places such as faith groups, community groups, housing associations, residents associations. Raising public awareness with key groups. Encourage intergenerational ideas of young people asking the questions. Information stalls (staffed) at GPs. Volunteers within the city encouraged to cascade information. An older person/older people being spokespersons. How to communicate/reach those who are most in need or who aren’t being heard. Every street has an older person community active champion. All older people, their friends, family and support networks to easily get the information they need and want to make their lives better. 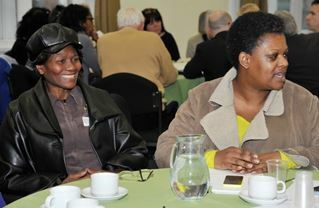 All older people to have a package of support to enable them to use the basic digital technologies of today to connect to others in communities and localities and help themselves to live better lives. One contact line (child line equivalent) for age friendly advice and support based on information from all partners across localities. All partners collaborating, putting aside (in some small cases) issues of boundaries, control and competition, to provide their information to a common standard that means it can be aggregated and easily searched and viewed from one place – either by the operators of the “one call line” or directly via search from the web by people, families, carers etc. All partners supported and trained in the use of Digital Technologies to improve the way they provide information and communication to people. Take up of services – calls, web/app hits etc. Number of partners committing to provide information to a common standard. Number of older people and partners trained and using technology. Stories and case studies showing the above. Produce case studies, real and personas, to demonstrate how they can help people and encourage others to take up. By older people for older people. Raise the awareness of the needs and wants of older people with all communities and localities. Bring together people wanting to engage and help older people (especially the lonely). Create a network of older people champions/enablers in different communities and localities. This awareness and enrolment campaign (like that of Child Friendly Leeds) can be done as low cost targeting included amongst other things. Which other partners do we need to work with? Chamber of commerce – access the business community and their CSR funds. Universities – access to students and research. Taking people out for your benefit, not just them. Spend some time with older people. Focus and target places old people are at – the bus. Write to all of our partners to enrol them in these ideas. Integration around the individual – beyond health and social care. Older People being valued and seen as assets. Needs of family carers – good health. Independence and being in control of own support. Live well with long term conditions. Happy life and dignified death. Good quality info and advice. decreased inequality across Leeds and country. If older people need services how do they access. Will they stay – to own communities. If older people understand what will happen. How get info and advice to people. Not currently known to Neighbourhood Networks. Improve integration for people – health/social care/community. Ensure people are supported at home properly. Make sure older people don’t spiral unnecessarily and don’t forget about frail elderly. Eliminate housing and health and safety hazards in all tenures. Building regulations fit for purpose. Maintenance of outdoors/garden plus associated costs. Transparency of cost (including maintenance). Maintain a healthy level of temperature. Affordability (cost of running the house). Supply of housing – right numbers, right choice, right locality. Older people have access to housing which is tenure neutral/safe secure energy efficient. Proper advice and information about their housing options, incorporating peer support. 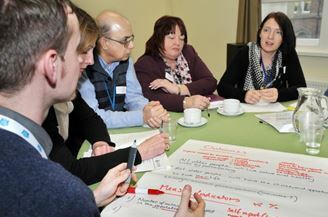 Discussion about hospital discharge – communication of all services currently in place. No-one has their stay in hospital delayed due to inadequate housing. Who has responsibility for discharge? % of homes in accessible environment. % of new housing for older people that is mixed – age/mixed community localities. % of people to safely stay in their own home if that is their choice. % of older people to be supported to move if they wish. % of older people in fuel poverty. Have to ask the people who actually live there. Depends what age. Imagine what you think we should have. Framework – bounce off people who represent older people. Housing Associations problems more difficult to solve/address compared to council tenants. Health Social Care, third sector all work together to ensure that older people live in/have access to. Current standards for housing don’t meet the needs for tomorrow. Services not understanding, involving and acting on feedback from older people, not just the most outspoken. Harnessing the reach, responsiveness and power of third sector. Personalised budget to include option/allocation for home maintenance/aids and adaptations. Think about housing for the ‘future’ older people. Reduce waiting time for assessment and assistance. Integrate housing support and advice into Integrated Health and Social Care teams and make this an integral part of personalised care plans. Integrate housing support and advice into care plan for mental health and patients in GP practices/primary care. (e.g. West CCG PEP model which incorporates housing). Engage on an ongoing basis through variety of methods/access routes. Appropriate facilities ie benches in public spaces, toilets, appropriate path widths. Leeds should have a pragmatic evidence based approach where we are clear on what works and how it is applied. Leeds City Centre will be a welcoming place. Could these issues be addressed through pedestrianisation of public spaces? Reduction in the decline of community venues including pubs. Linked to the above why is this issue exacerbated in older people at night time. How do we overcome the perceptions about the younger generations? Perhaps a perception that the world is changing around some people- leading to perceptions of no longer belonging- how do we address this? Can more facilities be provided? How do people use their park at present- are we clear on what is appropriate and is working. What activities would make people engage and take part- how can this be used to address physical activity issues? Could we develop a concept of older people play in Leeds? Are we clear on examples of best practice? Have we undertaken a review so we are clear on the accuracy of anecdotal views? 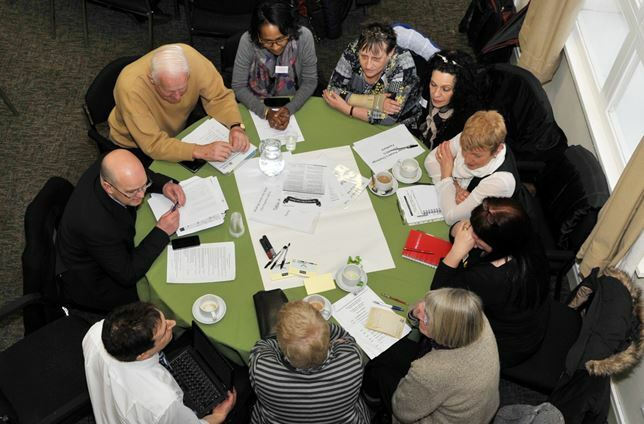 Could Leeds be at the forefront of intergeneration focus groups/ workshops and consultation events? Do we have sufficient in sight? Older persons school governor rep? Our key idea is that Leeds should become a fully accessible city where physical and emotional barriers are removed. Everyone has access to a healthy diet. Older people are able to be active. Every older person feels worthwhile and able to contribute. Projects have a proper legacy, building capacity within existing groups. Older people are independent and able to make choices. Older people feel and are safe. Number of people referred to organisations. No. of/attendance at luncheon clubs. No. of meals provided to older people. No. of cookery courses provided. No. of oral stories captured recorded. organising events (by them for them). Services don’t actively seek out service users? All older people will live active and healthy lives by participating. All older people will have the choice, and opportunities to live their life through social participation (indicator). Number of activities accessed in the population. Number of older people who feel more connected to their community/services. Number of older people who report feeling a better wellbeing. Self-report (feeling) QOL numbers of activity, happiness, feel connected, reduction in low mood, mental health depression/anxiety. We need transport which is accessible. Good sound information on choice for all activities. Constant and correct information streams. Partners are to improve full connection. Older health services in home can reduce access to their choice of enjoyment. Increase positive profile of older people. Pre-retirement course/info or support ASK THEM (no cost via LCC website). Increase older people chosen activity/supply. Engage local business e.g. Asda. An audit to see what activities old people want. Train staff/workforce on issues and tie with dementia friends. 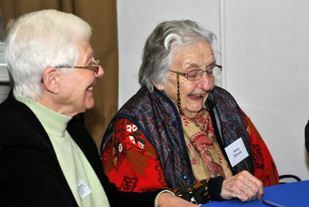 Use ‘made in Leeds’ has older people programme on choice activities. Media (all streams) to broadcast live messages. Roll out SENS (senior networks) technology training. All services created are sustainable or has exit choice. Positive lives movement from Sweden. Finding the most isolated older person and connect them. Target choice options to local shops or businesses and libraries. Some are not physically able to get out so requires services to get to them. Resources needed in suitable text size. Confidence due to light, weather. Use of sports clubs to improve connectedness. Culture, religion and faith groups (more offers and accessible for all). Older people can go where they want, when they want with the necessary support. Transport is not a barrier to independence. Older people feel safe and are in a clean environment. Being able to be independent and able to walk and cross roads safely. More older people using public transport. Increased take up of better transport. Payment with one method/Oyster Card – include trains? Promoting technological solutions – app for bus journeys, supplement other information. Free bus passes to continue, more publicity for companion bus pass. Private hire – small local companies. 47 feedback forms were received (55% response rate). 42 out of 47 attendees agreed or strongly agreed to the question “The event met my expectations”. 46 out of 47 attendees agreed or strongly agreed to the question “I had the opportunity to express my views in the workshop”. 43 out of 47 attendees agreed or strongly agreed to the question “The venue was suitable and easy to access”. Not all respondents replied to every question. What was the most useful/interesting part of the event? The array of topics on the agenda and meeting people from different sectors. Found it all interesting. Listening to other people’s ideas. The opportunity to have a free rein conversation – sharing experiences and exploring alternatives with the group. Desire of Council to recognise the older people need. Introducing presentations were interesting workshop discussions and listening to older people’s input. Participating and expressing and discussing topics and views to make a difference in the future. Sharing the learning and understanding some of the challenges facing older people. What was the least useful/interesting? Too much too many; too little space to short a time. The explanation of OBA could have been clearer – possibly due to the lack of slides/PowerPoint. The acoustics were quite bad with many large groups in one room, so it was hard to hear at times. Important to recognise what is already in place – build not reinvent. Great fitness MOT to break up/lighten mood. The room was too full and quite uncomfortable. I couldn’t hear some of the round table discussions because of the noise from other tables. Otherwise- interesting and informative. Hope it goes somewhere! We need to bring all the good stuff together- there is a load of things happening to help this agenda.